Here is some interesting information for all you “mom bloggers” out there. The Gabby Moms blogging program is gearing up to begin the application process for next year - 2012. If YOU have a blog of your own, and are interested in joining the team, please take a look at this APPLICATION PAGE to read more about the program and/or to apply. Let me tell you right now, this is not just your ordinary blogging review program. When I first signed up to be a Gabby Mom, I thought I was simply joining an ordinary review program where I would receive a product, use it, and write a review on my blog. But, it turned out to be much more than I expected. It has been fun for me, and a learning experience; but also challenging. I have been challenged in many different ways, including ways to improve upon my duties as a wife, a mom, and as a Christian. That said, if you enjoy learning about new products for wives and mothers, if you enjoy writing reviews, if you have the time to commit to reviewing at least one product per month, and if you are willing to be challenged in various ways... then you would fit right in! So, go ahead and fill out the application form today! On another note, us Gabby Moms were given another product of Lorrie Flem’s to review this month. (She’s the publisher of Eternal Encouragement Magazine... remember?) Well, this product has so much information in it that we were told to separate it into two different reviews. 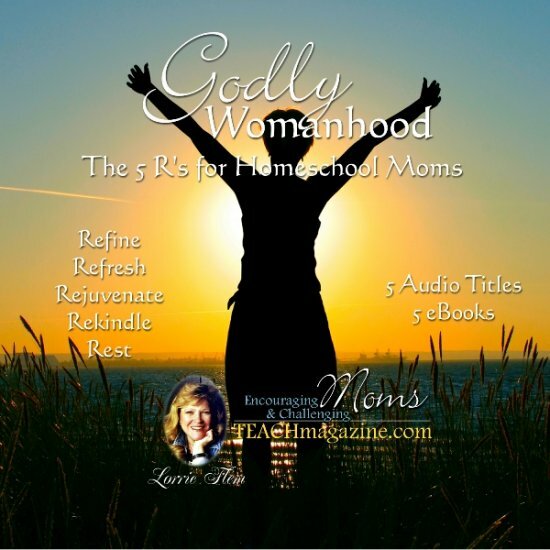 So, this month, I want to share a series of “fives” with you from just the first 2 sessions (the first 2 “R’s”) of Five R's for Godly Womanhood. You cannot have a growing relationship with anyone unless you spend time with them. That includes the Lord. Daily quiet time helps us get the strength we need to make it through the day. None of us have enough time to spend time in Bible study and prayer - we must MAKE time. Time with the Lord should not be a “chore”- it is a privilege. Meditate on Scripture. Pick a verse each day and read it over and over. Focus on it throughout the day. Incorporate it into your life and it will help you to maintain a right frame of mind. Loving our spouse MORE than we love ourselves is the key to keeping a marriage strong. Flirt with Him. Treat him the way you treated him when you were dating or first married. A lack of desire from you is not a reason to deprive him. Nagging doesn’t work. If you consistently feed him love, encouragement and affirmation, he will feel loved, desired and safe. This is when he is more likely to listen to you, versus your nagging at him. Its not your job to change your husband. Its your job to love him, and God’s job to change him. Disclaimer: I received The 5 R’s to Godly Womanhood as an official member of The Gabby Moms blogging program for Eternal Encouragement Magazine. I did not receive compensation for this post and all opinions are solely my own. Great review Vicky. I love reading about what you took from the products. They are so great and speak to each of us in different ways! It was a little overwhelming, wasn't it? You picked such great tidbits to share! Thanks for your review. Nice review, Clean and too the point! :) Like it!